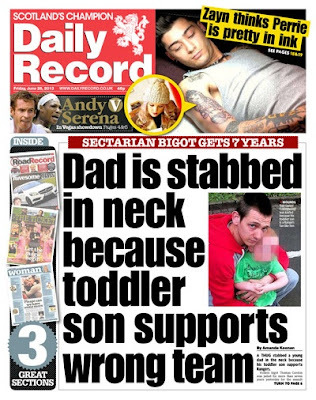 A THUG stabbed a young dad in the neck because his toddler son supports Rangers. Violent bigot Thomas Gordon was jailed for more than seven years yesterday for the assault on Daniel Collingwood after a party in Govan, Glasgow, in January this year. Gordon, 36, smiled and gave a thumbs-up to two women in the public gallery as he was led to the cells. The High Court in Glasgow had heard how Gordon’s on-off partner held a Hogmanay party and he was there with his brother Edward, 44. Daniel and his girlfriend Danielle Gordon – the accused’s niece – also attended. It is believed members of the Gordon family are Celtic-minded while the two-year-old boy is already a Rangers fan – and the court heard another row broke out after the party over what religion Daniel’s son should follow. Mr Fairlie said: “The accused left the living room and went into the kitchen. Mr Collingwood felt uneasy and became concerned for his safety. The blood-soaked victim escaped and an ambulance was called. The court heard he had two serious wounds to his neck – one an inch from his jugular vein – and was left scarred for life. Judge Lord Turnbull jailed Gordon for seven years and two months and told him he was lucky not to have been facing a murder charge. Gordon did stand trial for murder in 2004 accused of killing a man at a karaoke night – but he walked free after a jury returned a not proven verdict. In 1995, he was jailed for six years for assault. He also has a previous conviction for carrying a knife. Last night, Daniel’s father Brian told the Record: “I think Gordon is absolute scum and we were hoping for a tougher jail sentence.